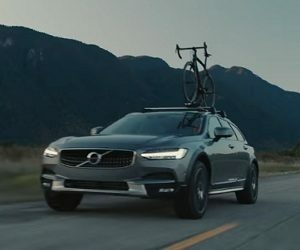 Volvo has released a new commercial, featuring the new V90 Cross Country Luxury Crossover and reminding you to not forget what you love. The spot, created like a short film titled “Live Fully Now”, features an original speech by the philosopher Alan Watts, recorded in 1959, and reminds us all to not forget what we love, all the activities that we once embraced. “And then suddenly, when you’re about 40 or 45-years-old, in the middle of life, you wake up one day and say: Huh, I’ve arrived. And while is it of tremendous use for use to be able to look ahead and plan, there is no use planning for a future which, when you get to it, it becomes the present you won’t be there. You’ll be living in some other future”, says Watts, adding that “in this way, one is never able actually to inherit and enjoy the fruit of one’s actions”. “You can’t live with all unless you can live fully. Now”, is the statement ending the film, along with the onscreen line “The Getaway – Our Idea of Luxury, The All-New V90 Cross Country – Our Idea of Luxury”.